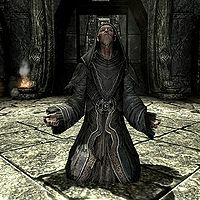 The Greybeards, an ancient and honored order of monks, live in silence at the ancient monastery High Hrothgar near the summit of the Throat of the World. They are the most famous of the Tongues, or masters of the Voice. Jurgen Windcaller founded the order in response to the Nord army's defeat at the Battle of Red Mountain circa 1E 416. After the battle, he meditated for approximately seven years, and arrived at the conclusion that the power of the Voice should be used primarily as a means of attaining enlightenment, rather than a tool of war. Jurgen called his new philosophy the Way of the Voice, and preached a lifestyle of meditative study of the Voice which the Greybeards carry on to this day. 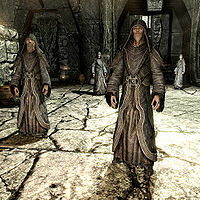 As part of the Main Quest, the player must learn the Way of the Voice from the Greybeards. Contrary to popular misconceptions, the Greybeards are not, strictly speaking, pacifists; the Way of the Voice teaches only that violence is the least of the Voice's uses, and it should be used for that purpose only in times of "True Need". The coming of a Dragonborn is considered such a time, and so the violent use of the Voice by a Dragonborn can be "overlooked", though the other followers of the Way are expected to remain peaceful. While the Greybeards apparently accept almost all who show a talent for the Voice, few can handle the demands of their lifestyle; renowned figures such as Ulfric Stormcloak have either failed to develop their skills or failed to live by the Way. Paarthurnax, the Grand Master of the order, made his home alone above High Hrothgar, at the summit of the Throat of the World. At High Hrothgar, you will find four Greybeard Elders living in the secluded mountain refuge: Arngeir, Borri, Wulfgar, and Einarth. Arngeir, the eldest and most powerful, is the only elder who speaks more than a few words to you, explaining that the others are so powerful that if they were to utter more than a whisper, the force of their thu'um would destroy you. Arngeir may only speak because of his extensive training and age. After a series of trials, Arngeir and the Greybeards proclaim you Dragonborn, and will begin to teach you to master your Voice. The Greybeards spend most of their time in silence, which is only broken to revere the gods with an Unrelenting Force shout. Once The Horn of Jurgen Windcaller is complete, the Greybeards will officially welcome you and open all of High Hrothgar's items to you. After the quest Alduin's Wall, they refer you to the grandmaster of their order, who lives atop the summit of the mountain. The grandmaster is, in fact, an ancient dragon named Paarthurnax, who is willing to aid you in defeating Alduin. The Greybeards stand in opposition to the Blades, whom they view as intolerant barbarians. 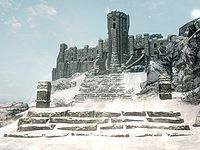 If you side with the Blades following the Main Quest, the Greybeards will become borderline hostile towards you and refuse to help you find any more Words of Power. If you try to talk to another Greybeard besides Arngeir, their voice will sound like thunder as they whisper "Dovahkiin". This happens after the Greybeards have acknowledged you as Dovahkiin in a formal ceremony. If attacked, all of the Greybeards use the Ice Form and Fire Breath shouts in retaliation. The Greybeards do not attack a Stage 4 Vampire. This page was last modified on 29 December 2018, at 06:48.